Be sure to check out Part 1 of this post, when the activity was assigned (i.e. if you were absent from E/M yesterday). 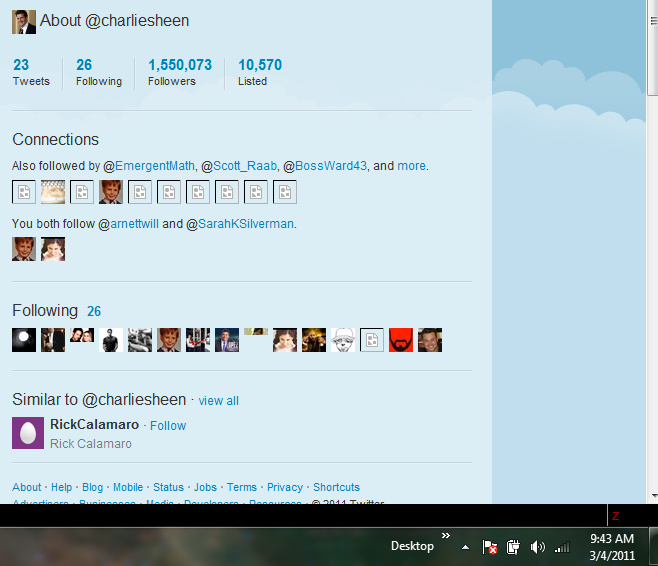 There I provided my data on the number of Charlie Sheen’s twitter followers and the time. I hypothesized that it would be a more-or-less exponential growth curve. I’ll break this up into a few different time pieces. 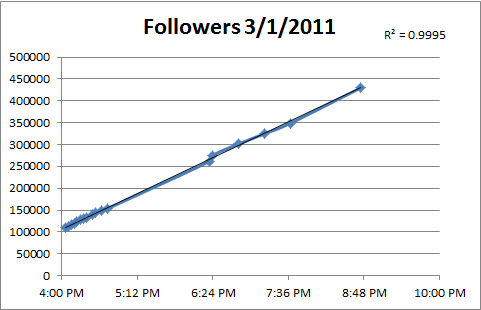 Here’s the plot of Charlie Sheen’s followers as I have them, only for 3/1/2011, the day he joined twitter. Not only is that a linear fit, it’s very linear (R-squared of 0.9995). I’m also shocked at how straight that line is. That is, there are not spikes of activity. I would have thought that in the evening, when everyone’s sitting in front of their TVs with their iPad 2’s there would be a marked increase in @charliesheen twitter followers. 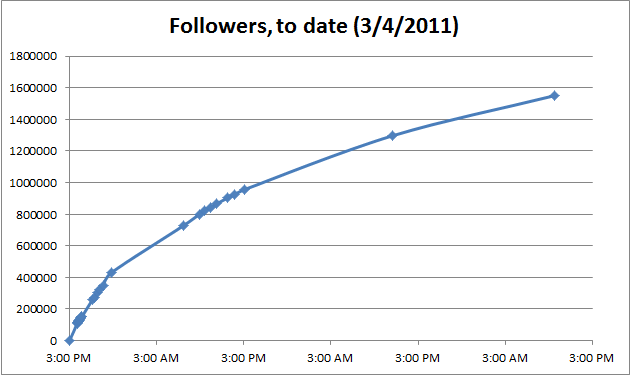 Now let’s look at the same graph, but with all of Day 2 (3/2/2011) data included. Unfortunately, I didn’t check Sheen’s twitter followers in the middle of the night, but it appears to have leveled off slightly going into Day 2 of the twitter account. It looks like you could either construct this as a step-wise function or a quadratic-decay function. This is the Google realtime search feature. I would assume there’s a strong correlation between the Google realtime searches for “@charliesheen” and the activation of the twitter account. 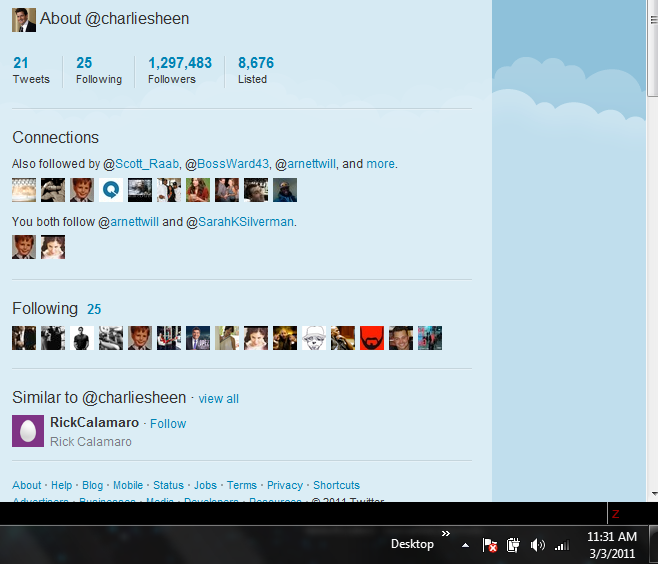 So it looks like the account may have gone active sometime in the mid-afternoon of 3/1/2011. Let’s call it 3:00 PM. In that case, we’d have the following curve. 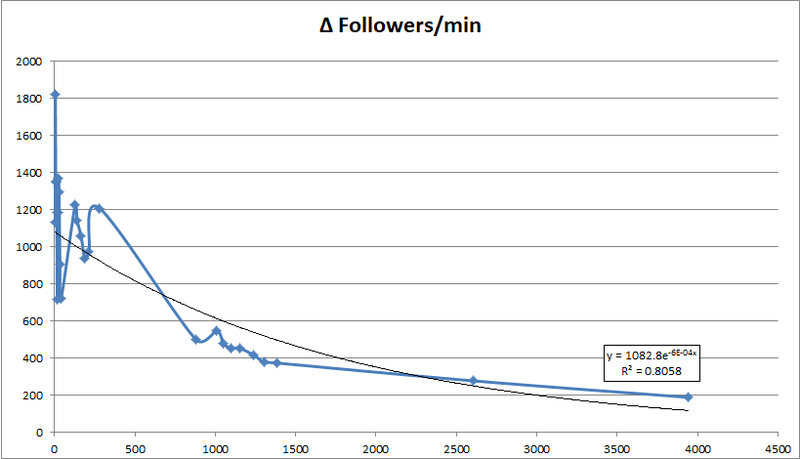 The followers-curve really looks like it’s tapering off here. Let’s add a couple data points. I took two more “measurements“. One yesterday, and one, just now. So at 11:31 AM yesterday, he had almost 1.3 million followers. At 9:43 AM today (3/4/2011) he had 1.55 million followers. Adding that data to our chart yields the following. 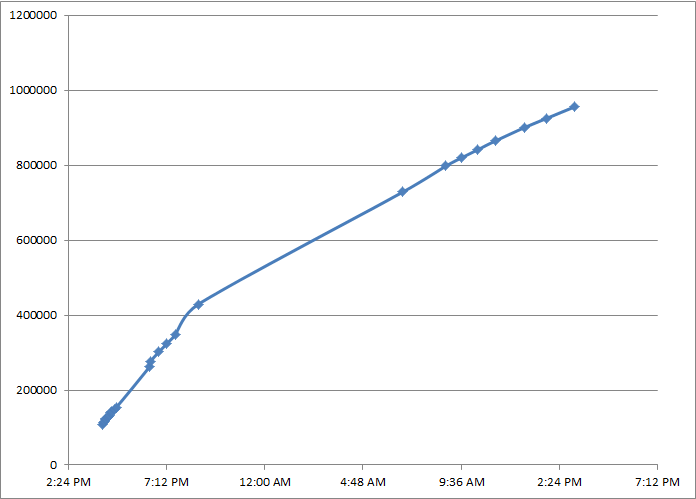 While still climbing steadily, the curve is nowhere near as steep as it was on Day 1, which is probably to be expected. Hey, I bet the slope of the line over time would be interesting. And that would give us a clue as to where this thing is headed. 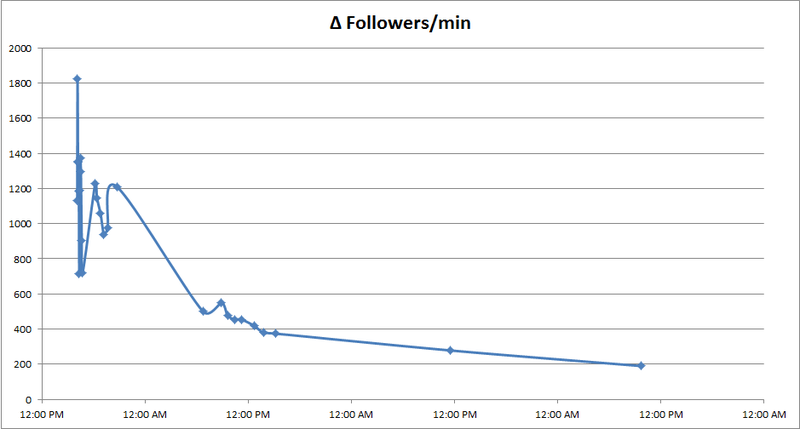 Let’s break it up into (Change-in-followers per minute) vs. (time). There’s my exponential! We’ll have to fudge the x-values a bit to get an actual equation and trendline. And you know what? I bet if I tossed out a few of those early, “noisy” observation, we’d get a much better fitted curve. But still, it looks like you can pretty well describe the behavior of Charlie Sheen’s number of twitter followers with this exponential decay curve. Now, what can we do with this? Was this just a ridiculous exercise by someone who spends too much time in front of his computer? Perhaps (probably). But are there any implications for the dramatic growth and tapering off of a (sort of crazy) celebrity twitter followers? Remember in 2010, when LeBron James joined twitter before his announcement of where he was headed, dubbed “The Decision” on ESPN? His twitter followers had a similar explosion at the beginning before he even tweeted anything. I don’t have the data unfortunately. While everyone agrees that “The Decision” was a huge PR mistake, everyone also agrees that the ratings for “The Decision” were through the roof. Let’s put it this way: more people watched “The Decision” where James announced which team he would join than many actual NBA Finals games. Did the simple creation of the twitter account boost the ratings? What if “Two and a Half Men” came back on the air now? I have to assume that the ratings would be similarly boosted. James Franco did something similar before his hosting of the Oscars, joining twitter beforehand. You think agents and TV and movie execs aren’t aware of the “twitter-effect?” Of course they are, and they’re probably also interested in some of the hard data that comes along with it. This was fun. Let’s do it again sometime.